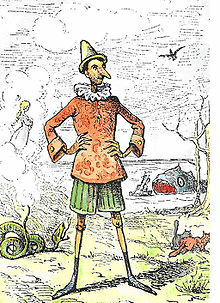 The Adventures of Pinocchio (Italian: Le avventure di Pinocchio) is a story by Carlo Collodi. It was first published as a serial in a children's magazine between 1881-1883. The serial ended tragically with the death of Pinocchio. It was published as a book in 1883 with black and white illustrations by Enrico Mazzanti. Pinocchio tells the story of a puppet who wants to become a real boy. The book has been adapted to movies. Zipes, Jack (Ed.) 2000. The Oxford Companion to Fairy Tales. Oxford UP. pp. 384–5. This page was last changed on 28 February 2014, at 04:16.